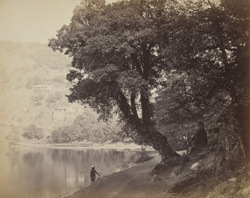 Photograph of a view of Nainital in the Kumaon Hills, Uttaranchal from the 'Strachey Collection of Indian Views', taken by Samuel Bourne in 1865. In the 19th century the area around Naini Tal was favoured by the British because it ideally suited their Victorian taste for the romantic pastoral. It was chosen owing to its pleasant climate and spectacular views of forests of pines, firs and cedars and rows of snow capped peaks disappearing in the distance. It became a venue for leisure activities and the area rapidly acquired a reputation as a sanatorium.